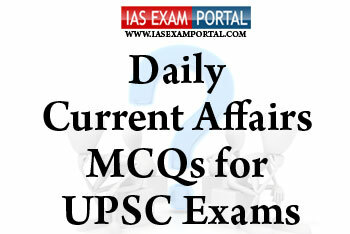 Current Affairs MCQ for UPSC Exams - 06 FEBRUARY 2019 | IAS EXAM PORTAL - India's Largest Community for UPSC Exam Aspirants. Q1. Which of the following statements with respect to the newly introduced Rashtriya Vayoshri Yojana are true ? 1) It has the objective of providing Senior Citizens, belonging to BPL category and suffering from age related disabilities/ infirmities, with such physical aids and assisted living devices which can restore near normalcy in their bodily functions. 2) The Scheme is being implemented through the “Artificial Limbs Manufacturing Corporation (ALIMCO)”, a Public Sector Undertaking under the Ministry of Social Justice & Empowerment, as the sole Implementing Agency. 3) The beneficiaries are identified through Assessment Camps organised in collaboration with the respective State Government/District Administration and the devices are distributed in Distribution Camps organised in all the 640 districts of the country. Which of the above pairs are correctly matched ? 1) "The National River Ganga (Rejuvenation, Protection and Management) Bill 2018" provides for the constitution of Ganga Protection Corps as an armed forces of the respective state governments through which ganga flows. 2) The Ganga Protection Corps is proposed to be empowered to arrest or caused to be arrested for offence under the Act, and to take the person to the nearest police station. 3) The draft Act contemplates certain provisions conferring powers to the National Ganga Council to arrange to carry out impact assessment of certain projects and activities which affect the flow of water in river Ganga. 1) An Intellectual Property Rights Facilitation (IPF) Cell has been established under the Department of Defence Production to promote self-reliance in Intellectual Property Rights in Defence Sector. 2) Department of Defence Production has launched the “Mission Raksha Gyan Shakti” to encourage Defence Public Sector Undertakings (PSUs) and Ordnance Factory Board to boost “IPR culture” in their respective organization to promote self-reliance in defence sector. 3) The innovative research undertaken by Defence Public Sector Undertakings and Ordnance Factory Board is helping in indigenization of existing system / platform to bring down import contents thereby resulting in cost savings.